28 March 2019: We’re very handy with tools and design, and that saves money, while giving us a chance to exercise our skills. 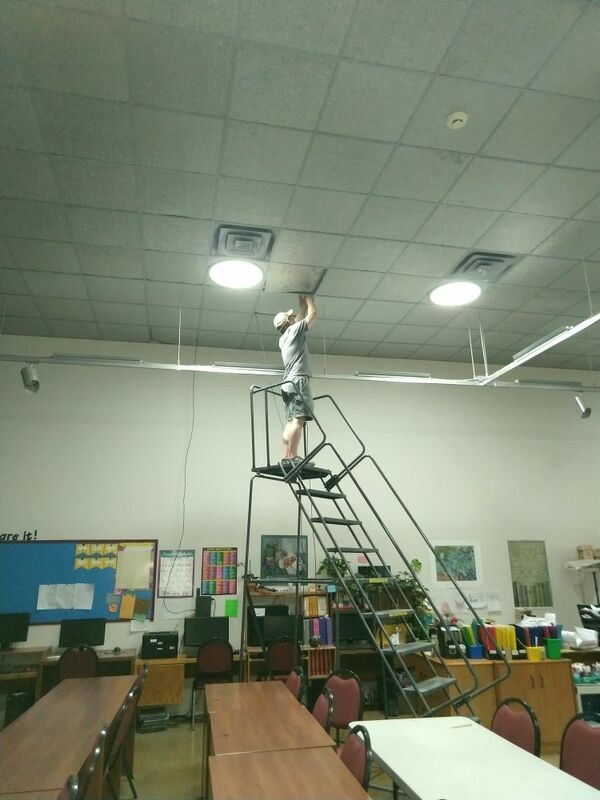 Here, computer programming teacher Mark Leisher is stringing CAT-5 Ethernet cable across the rooms for a better connection to the managed switch at our student computer cluster. It’ll take another 4 hours to complete the stringing (it’s a long sequence of push up the metal tiles, pull the cable, replace the tile, and repeat). The building has multiple, complex ceiling layers; fortunately, building manage Bryan Fallstead knew where the breezeway through the firewall between gallery rooms could be found. Meanwhile, Head of School Lou Ellen Kay and Board Chair Vince Gutschick (not in the picture – rather, taking it) are putting up a new 43” monitor for the Spanish and English classroom of teacher Elizabeth Brasher.